Μaria Chatzi, author of the ebook “Ο magikos kirios Kolotoumpas grafei istories”, shares with us step-by-step instructions to create the wish tree bookmark, inspired by the fairy-tale “To dentro tis alithinis efchis” by Chrysoula Loulopoulou! 1. Use your pencil to draw the upper part of the tree on the thick green craft paper. Cut it out with your scissors and embellish it with the star stickers. See picture 1. 2. On the thick brown craft paper, draw the tree trunk and cut it out with the scissors. Along the center of the tree trunk (lengthwise) poke 4 holes, using a well sharpened pencil or a pen. 3. Glue one end of the satin ribbon on the upper back side of the tree trunk. Allow the glue to dry very well. After the glue has dried completely, pass the ribbon through the holes you’ve poked. 4. After you’ve passed the satin ribbon through the last hole, add the beads passing them through the ribbons free end – first the larger bead, then the smaller one. Then make a knot that would secure the beads in place. For steps 2, 3, 4 see picture 2, which shows the back side of the tree trunk. 5. To continue, glue the upper part of the tree to the tree trunk. 6. Fold your white paper strip in three, lengthwise, and use your paper hole puncher to open a hole on one side. When you unfold your paper strip there should be 3 holes, as shown in picture 3. 7. Write a wish in the inside part of the white paper strip and fold it again in three, as it was before. 8. Pass the colorful yarn from the hole of the folded in three paper strip and hang your wish from the satin ribbon of the wish tree, tying a bow, as shown in picture 4. 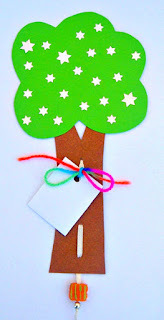 Your Wish Tree Bookmark is ready! You could tie more wishes on the tree trunk, or replace your wish with another one, once it is granted.